Power bowls are the new salads. Loaded with the freshest of fixins’, power bowls are the hottest new trend and they’re here to stay. If you’ve only heard of power bowls, now’s your chance to hop on the bandwagon. Say goodbye to sad salads and say hello a plant-based, Zen-inducing assortment of nutritious goodness. A spectrum of colors, textures, and flavors come together in perfect harmony for a filling and satisfying meal that’ll keep you full for longer. Piada Italian Street Kitchen serves up its power bowl true to fashion. A fusion of their signature ingredients captures the essence of timeless Italian street food while joining forces with a modern twist. A sweet corn and tomato blend balances out the roasted broccoli’s mild, earthy element, while pickled red onions and marinated zucchini punch up the flavor with a tangy zing. Glazed chickpeas add a pop of crunch, and it’s all rounded out with a smooth, mellow drizzle of harissa and greek yogurt dressing. It turns out Piada can do no wrong. 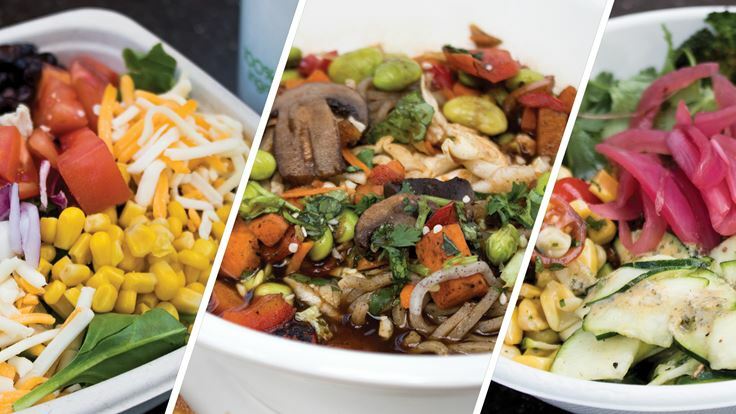 At Panera, it’s not just soup that comes in a bowl anymore—they’ve jumped aboard the power bowl train and now offer globally inspired bowls that stand out from the rest. Creative concoctions don the menu that showcase not-so-subtle traces of international influence. The Soba Noodle Broth Bowl warms the soul and will satisfy even the hangriest of shoppers. A colorful, crunchy cabbage blend balances out the soft and slightly sweet soba buckwheat noodle base. Roasted mushrooms and spinach pack in nutritional value, and fiery edamame adds just enough vigor to keep your taste buds aroused. It’s all tied together with a warm, savory umami soy-miso broth and topped with sesame and cilantro as finishing touches. It’s no surprise with a name like Freshëns, you can count on this food studio to serve up the freshest of fresh. Spicy Korean, Mexican, and Florence-inspired palettes don the menu for a diverse selection of flavor profiles. Savory black beans, salsa, corn, red onions, and cheddar-jack cheese come together for a boldly colorful bowl that tastes as beautiful as it looks. Leafy greens and white rice serve as its base, while zesty chipotle ranch tops it all off to keep the bowl balanced. Freshëns for the win.